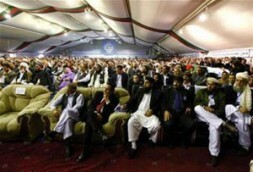 1,600 delegates assembled in Kabul in the first National Consultative Peace Jirga to discuss the reconciliation process: "The West and the Muslim world, including Pakistan, should support this effort because it is a good first step towards peace. Peace negotiations should start in Saudi Arabia with those Taliban elements who want to join. NATO must plan these negotiations as an integrated part of its overall strategy for Afghanistan, supplementing its military campaign. Until now the U.S. plan has been lacking this element. They should not wait for a successful military operation but act immediately. Afghanistan needs a new approach to reconciliation, and a new double strategy of power and reconciliation that includes both soft and hard factors for stability." From June 2nd to June 4th 2010, over 1,600 delegates from all regions and social groups in Afghanistan assembled in the first National Consultative Peace Jirga (Loya Jirga) to discuss the reconciliation process. The resolution that emerged is a document of hope and wisdom. Afghanistan needs a new approach to reconciliation, and a new double strategy of power and reconciliation that includes both soft and hard factors for stability. The World Security Network Foundation was one of the first promoters of this new political approach, and has called for talks with the Taliban and focus on these two pillars of peacemaking in several newsletters (see Hubertus Hoffmann: Afghanistan: Negotiations with the Taliban as the Path to Peace and Afghanistan & Pakistan: A new and comprehensive NATO Double-Track Decision is needed). To act and comply by the teachings of Islam and respect the aspiration of the people of Afghanistan for lasting peace and ending war and fratricide through understanding and negotiations. The peace and reconciliation initiative shall be for and among Afghans only and does not include in anyway foreign extremist elements and international terrorist networks. No peace efforts should question the achievements made so far or their legal values, and should not lead to a new crisis in the country. A High Peace Council or Commission should be created to follow up on the recommendations made by the Jirga and the Peace Process. The Commission shall form a special committee to handle the issues related to the release and return to normal life of prisoners. The West and the Muslim world, including Pakistan, should support this effort because it is a good first step towards peace. Peace negotiations should start in Saudi Arabia with those Taliban elements who want to join. Others, like those firing grenades at the assembly, will stay out for now. NATO must plan these negotiations as an integrated part of its overall strategy for Afghanistan, supplementing its military campaign. Until now the U.S. plan has been lacking this element. They should not wait for a successful military operation but act immediately in the framework of a new NATO double strategy of power and reconciliation that includes both soft and hard factors.